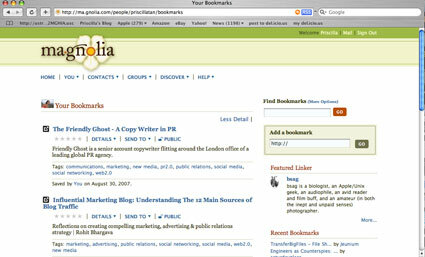 Some weeks back, I came across Ma.gnolia, a beautiful social bookmarking site. I have been happily adding and tagging my favourite sites in del.icio.us for a while now and I was not sure if I should sign up and add on to my long list of social network sites and tools. Today, I finally gave in and decided to just try it out. del.icio.us is a more popular social bookmarking tool around. It is functional, easy to use and it has badges that allow bloggers to display their del.icio.us bookmarks on their sites or even facebook. I am quite sure Ma.gnolia has that feature but at this point, I have yet to try. Ma.gnolia, in a simplistic description, is a very pretty version of del.icio.us. Even the name sounds pretty. When I first registered and login to the site, I was (as usual, a little lost) but I quickly found that it as a FAQ section and even a wiki to help users. It also has lovely avatars and allow you to put up your profile and pic. The “contact” adding part enables you to see the bookmarks of your contacts, friends, groups (of course, all displayed in a beautiful format). I am also able to import all my del.icio.us’ links to Ma.gnolia. I also came across a video tutorial on Ma.gnolia. Although I have a feeling that I am going to stay happily with del.icio.us, Ma.gnolia is such a gorgeous looking and social tool. The power of pretty things! Here’s a more detailed review and comparison on the two. Ma.gnolia might be more attractive for them to use. so ‘ll decide after importing my delicious bookmarks and viewing the results. Hi Siva. Try and let me know what you think. As of now, I have been sticking to del.icio.us, much simpler and gotten used to it. And thank you for sharing your del.icio.us links! Adding you onto my network if you don’t mind. After a month, I realised I stuck with del.icio.us. I guess with all the bookmarks in all my browsers, it was difficult to switch….